Hey, everyone, it’s me, Tom Iovino. I’ve been running this blog for more than five years now, and I think it might be time I updated my info. After all, my original post has been up for about – ohhh – five years now. I’m sure some of you might be wondering, “Just what else has this Tom guy done besides this blog?” I’ve been woodworking since 1998 in my garage workshop. During that time, I have learned a lot, and tried to share what I know with a other woodworkers. I’ve had a few successes, a few failures. That’s the way things go. During these years, I have compiled enough knowledge and first-hand experience to be considered an accomplished woodworker by some. Believe me, that came as a surprise! I am a frequent columnist for Wood Magazine, writing under the nom du bois The Shop Monkey. I will post updates to the blog as I get additional articles posted. Also, I am the top tipster on Wood Talk Online, offering Tom’s Tips for the listening audience. Sure, it’s tough being third banana behind Marc Spagnuolo and the Podfather Himself Matt Vanderlist, but hey, there are worse things! This old-fashioned adhesive can be a woodworker’s best friend. Here’s an article about how – and when – to use hide glue in your woodworking. Believe it or not, there’s woodworking taking place in Antarctica! Learn about the shops in the three bases run by the United States. Easy methods to draw curves that are fair and accurate on project components. Step-by-step instructions on how to use power carving tools to craft an Asian-inspired bench. See page 6 for an article I wrote about my woodworking hobby in this employee newsletter. While this magazine is no longer in production, here is the text of a biographical article on Plymouth, Massachusetts cabinetmaker Gail O’Rourke. Gail is an excellent woodworker and a dynamic teacher. I have also won awards in a National Arts Program contest three years in a row. It was quite a thrill to have my work recognized in this local contest. See a listing of those three projects here. You didn’t think I was just a woodworker, did you? I’m actually keep very busy as the dad of two active boys and the husband of a very loving – and patient – wife. 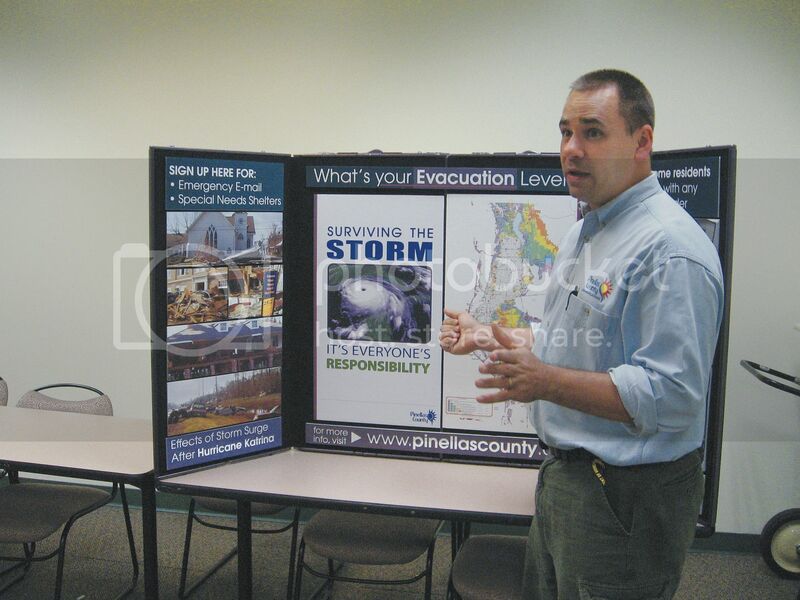 My ‘day job’ is as an emergency preparedness Public Information Officer for Pinellas County government. I have written a lot of the information that appears on our emergency management page. I do presentations and prepare information about all hazards we face in our community – from hurricanes and tornadoes to pandemic flu and hazardous materials incidents. In fact, you can also see me in several videos on the site as well, such as Shuttering Your Home, Charley’s Aftermath and Hurricanes for Kids. Since I am a weather nerd, I like to get lots of information about the weather. One of my favorite sites is Weather Underground, which was established by Dr. Jeff Masters of the University of Michigan. This is an awesome weather site with a very active meteorology community. I visit this site a few times a day – or more – if the weather warrants it. And, yes, I have a blog there as well. I do most of my work at home on a Macintosh computer. I started using them back in 1989 while at college, and I have been using them since. I find that Macs are easier to use and maintain than PC’s. In previous years, I wrote a regular column called Apple Cider for an online Macintosh magazine called About This Particular Macintosh (ATPM). You can view the archive of my articles online. I get the biggest kick out of coaching youth basketball. I’m a huge fan of college hoops, and I love prowling the sidelines during a game, imagining I’m Gary Williams, coach of the Maryland Men’s Basketball team. A great resource for coaches of all levels is Breakthrough Basketball. I’ve learned a lot from reading this site and appreciate the insight of the coaches who post there. One of my other favorite hobbies is cooking. I love to try new recipes in the kitchen, and I’ll go to any nationality’s cuisine. Italian, German, Japanese, Spanish, Cajun.. if it tastes good, I’ll cook it. One of my favorite sites for recipes is the Food Network. They have a great collection of recipes that includes what you see on TV and those from cookbooks. A great resource. What goes better with food than wine? I’m no snobbish wine sophisticate. I just love the drink. In places like Italy and Spain, the wines are meant to be drunk by common folk as an accompaniment with dinner or by themselves – definitely not something exclusive. I buy many my wines at Total Wine, but I will also go online at Wine.com for special bottles. I attended college at the University of Maryland, College Park. Those were four of the best years of my life (the ones I can remember, of course). It was, and still is, an excellent university in spitting distance of Washington, DC. Hey Tom, got here from TWW Forum. What a cool site you have too! Lots of cool stuff to explore over here! Well, welcome to the blog! Stop by and spend some time. Just so you know, I’ve been doing this since August of 2007, so there may be a few entries you may want to catch up on. Love the site layout! Is it wordpress? Oh, you betcha. I have Go Daddy for the domain name and the storage, and they run the WordPress software to manage the blog. It’s a very nice setup… and it’s dirt cheap ($40/yr?)…. Gotta love “The Wood Whisperer”. Learning all I can. 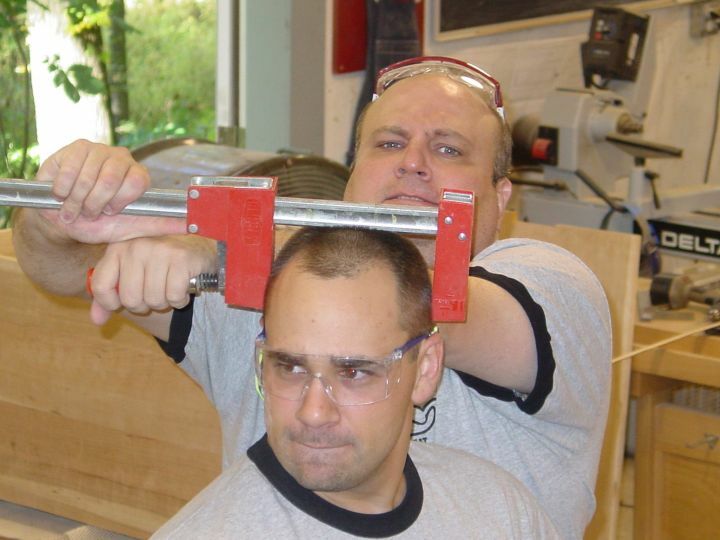 Marc Spagnuolo has set up one incredible site there – he’s becoming the Norm Abram of the online woodworking community. He’s helped put many talented woodworkers – and me – in the spotlight for others to learn from. The guy has a vision, that’s for sure! Thanks for the story about kick back. I have actually headed out the garage a few times over the last few weeks and had to turn around and head back in the house. We have a new baby and well I am tired all the time. I am a new wood worker and it was my suspicion that it was dangerous to work tired. I have been getting down on myself for not finishing a smal quick and easy project but am concered I will hurt myself! PS I am about to build my first cross cut slef and am copying the one you show above for small work! Thanks! PS: I got here from Marc’s site, your site is awesome thanks for taking the time. See you can tell I am tired from all of my typo’s! Great site. Lots her for me to learn and also to share with others. I will be here a lot. I like the site and was directed here from TWWG site (in a round about way) by clicking on What Marc’s Reading. I like the shop article. Have you incorporated any changes into the shop yet? Hey, Terry. I’ve made some small improvements over the years… Never anything radical, but when I look back a year, the changes are stunning! It may be time to do an update…. I just wanted to stop in to say hi! I am so happy I found this website. I also live in Pinellas County and have been thinking about getting a lot more into woodworking now that my kids are almost grown. My first build was a storage bed for my daughter last year. It isn’t perfect but she can jump up and down on it if she wanted and it would not fall apart. I am a big fan of Ana White (anawhite.com) who lives in Alaska and posts all sorts of furniture plans. Are you familiar with her? Also, Design Confidential is a good one. I am so thrilled that I found you and the wood whisperer…I want to learn but cannot afford the classes at PTEK which are over $4,000.00 – wow! Anyway, take care and thanks for much for putting this information out there! I love your site, a ton of useful information about woodworking. Thanks for sharing! Good day! Tom. I see something genuinely special in your web site. Bookmarked.